Happy Holidays from everyone on the Planets Hunters team. In that spirit, we thought we’d shared this: Santa in the Era of Kepler (courtesy: Joe Llama, St Andrew). Has anyone spotted that signal in the light curves? Each day this month, the Zooniverse has revealed a new gift on the Zooniverse Advent Calendar. Last year, Planet Hunters was hiding behind one of the doors for the launch of the site. This year here were the Planet Hunters themed gifts. Day 20: A Planet Hunters themed cocktail anyone? If not, try one of the other Zooniverse themed cocktails. And be sure to check out tomorrow as the last door opens on the Advent Calendar. Wishing you a very Merry Solstice and Happy Holidays from us to you. Hi Everyone! The first two planets have been published, so where do we go from here? We reviewed several hundred light curves that you flagged and boiled these down to the revised list posted on the planet candidates page. The Kepler team has reviewed the light curves of all stars on that list – several were identified as false positives, so we’ll be moving those stars off the planet candidates page. However, about ten objects passed the first stage of validation and now Jason Rowe, Steve Bryson and Natalie Batalha on the Kepler team are looking at them more carefully and I’ll be traveling to NASA Ames soon, to meet with them about this work. You also discovered several eclipsing binary systems and we are working with planethuner kianjin on this. One of our Yale undergrad students (Farris Gillman) is traveling to meet with Prof Andrej Prsa (at Villanova University) next week and model these EB’s. We’ll post an update for you on progress from that work in the next week or two. Another one of our undergrad students (Charlie Sharzer) is working on a senior thesis project, modeling the dynamics of moon captures by planets. He is hoping to figure out which of the Kepler planets are a priori most likely to harbor moons. The Kepler space craft is continuing to collect more data on stars in the field, however the Kepler field is fading from view of Earth-bound telescopes as we orbit the Sun – the stars will be visible again in April 2012 when we’ll be ready to follow up on additional candidates that you find in the Q3 and Q4 data. Its getting closer and closer to the day when the Kepler team will release the next few quarters of data. To get ready for it we are working hard behind the scenes to turn your clicks in to science and even more planet candidates. That doesn’t mean however that the science team isn’t lured by the hunt for planets. We all routinely go digging around in the light curves ourselves to help get that classification count up. Don’t believe us ? Want some proof? 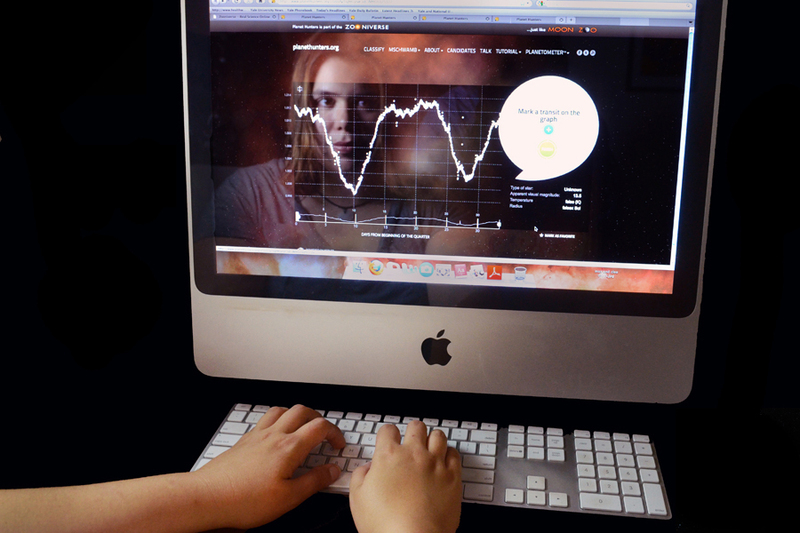 Well just take a look at this image of Meg intently looking for those elusive transits. Following the news that the first Planethunters paper has been submitted, we thought we’d write a little bit about what peer review is and what it does. This is relevant not just in charting out the future of our first paper, but also in the wider discussion of scientific results in the media. This post is an adapted version of a post I wrote for the first Galaxy Zoo paper that was submitted in 2008. What’s scientific publishing all about? How does it work? If you’ve followed the blog and the forum, you have a pretty good idea of the first part of the scientific process: discovery! We figure out something new about the universe and how it works. This is one of the amazing and unique things about science. Good scientists spend most of their time arguing against the effects they see in their own data, to avoid falling into traps of seeing only what they expect to see. To see how unique and amazing this is, try to imagine a politician arguing against a piece of legislation s/he is sponsoring! This process of double, triple, and quadruple-checking one’s own work is a very important part of science. Once we were convinced that we really understood what is going on, we could then write up our conclusions in the form of a scientific paper. Over the past few weeks, the Planethunters team, together with colleagues from the Kepler team, wrote up a paper describing the first results. The paper was passed back and forth between people who made edits and comments and the paper thus passed the first through the first check — our own examination of our results. e next step in scientific research is to submit the paper to a journal. This has now happened, and the paper Fischer et al. (2011) (where “et al.” means “and the rest,” including YOU!!) has been submitted to the top UK journal Monthly Notices of the Royal Astronomical Society (MNRAS). The editor of this journal will now select an anonymous referee who can comment on the scientific and technical merits of the paper. The referee is another astronomer or cosmologist whom the editor can ask for an expert assessment of the work. He or she will have a few weeks to read it, think about it, and then make a number of recommendations to the editor of the journal. There are three options. The referee can reject the paper outright. This generally happens very rarely, except in highly competitive top journals like Nature and Science. They can support publication of the paper, asking for only a few minor modifications. This also happens quite rarely, though! The most common outcome is for her to write a “referee report,” suggesting a number of modifications and ask for clarifications. The referee might have questions about some part of the analysis, suggest some alternative thoughts and ideas, or criticise the methodology. Sometimes referees can be hostile to a paper; but often, they are genuinely helpful and constructive. After receiving the report, we get a few weeks to digest it and modify the paper according to the referee’s comments, and argue against the points raised that we disagree with. This process may repeat itself a number of times if the referee isn’t happy with our modifications, and so it can often take weeks and months for a paper to get to a decision by the editor (acceptance or rejection). If a referee is being particularly unreasonable, we can write to the editor requesting a new referee. In extreme circumstances, we could even choose to submit the paper to a different journal and hope for a more reasonable referee. The whole process is generally known as peer review since the referee is a peer — a fellow scientist and expert in the field. If the paper is accepted, it will appear both in the online and print version of the journal after another few weeks or months. A paper accepted in such a journal is then considered peer-reviewed. It’s important to note that something said in a “peer-reviewed” paper isn’t necessarily true. The point of peer-review is to weed out obviously flawed paper whose logic has holes or whose data don’t support the conclusion. Knowing that a paper has been peer-reviewed should give you extra confidence that its results are believable – that means that an expert in the field has read through the paper and thinks its conclusions are believable.It’s really just the first step of proper “peer-review,” because the process continues. As the community of astrophysicists digests the paper, they too pass judgement on whether they consider the paper important and whether they believe the conclusion. Thus, in the years after publication, other astrophysicists might deem Fischer et al. (2011) a key paper and cite it in the future, commenting on it positively. Or they might disagree with it, but that would still be a sign that it was important enough to comment on. Or it might just fade into obscurity if astronomers don’t consider it important. That’s the historical legacy of a paper – and that’s the ultimate peer-review. Dear planet hunters. First let me start off by saying that its fantastic to see the planetometer getting so high, it constantly impresses me how much work the planet hunters community has done and continues to do each day. We worked it out recently and the community is the equivalent of 51 full times employees constantly working on the site! We take the work you do very seriously and try to make sure that none of your time and clicks on the site are wasted. We make sure that every night the entire database of your classifications on every one of our sites is backed up. We rarely have to use these backups and have only had to resort to them twice, once was after the big outage of amazon web services about a month back and the other was last week on the 28 of June. While trying to look at some of your data and prepare it for the science team I accidentally issued a command to the database that the live site uses rather than the copy of that database I have on my machine. The result was not good and we had to restore the database from the pervious nights back up meaning we lost any classifications that where made between the backup and my error. This was a terrible thing to happen and I cant apologise enough to the people who lost classifications. Thankfully we only lost about 4 hours of classifications between 6:40 am and 10:40 am (uk time) which is a quiet time for the site. Hopefully this means that most of our users will have been snugly in bed or getting ready for work so I hope the damage was minimal. Even still we always try and learn from our mistakes so that they dont happen again in future. As always, we value your continued hard work and effort. Hello Planet Hunters, my name is Thomas Esty and I am an undergraduate at Harvard who is working with the PH team at Yale this summer. I’ve been here for 5 weeks now, and have been working on a number of projects related to the Planet Hunters site. The first one is going to roll out soon—it’s a new How-To/Getting Started page that brings together information from the science page, the blog, and even some new material to give new users a more in-depth look at how to use the website and what they might see in looking at the light curves. Take a look at it when it goes up, you might learn something new—we discuss simulations, flares, and eclipsing binary stars among other things. It’s also makes a great time to introduce new people to Planet Hunters. Another project is doing statistical analysis on the 1.5 million point data set from the Planet Hunters Quarter 1 classifications. We’re looking at how people classify stars as variable or quiet and then the type of variability. The last thing that I’ll be doing is starting to build an educational outreach program using the Planet Hunters site. I’m looking to create lesson plans and worksheets for middle and high school level students to get involved in the search for exoplanets and get excited about doing real science. All of us are excited by how far we’ve come with your help in making Planet Hunters a success and we’re looking forward to what we will be able to do to expand the reach of this site and of citizen science in general. Today’s blog is by guest blogger Dr. Jay Pasachoff. Jay is Chair of the International Astronomical Union’s Working Group on Eclipses and is Field Memorial Professor of Astronomy at Williams College. He has viewed over 50 solar eclipses, and is an expert on both their use for scientific observations and their use for public education. Jay has has authored and co-authored several astronomy books including the Field Guide to the Stars and Planets. Today he’ll be talking about a different way of planetary bodies blocking out star light that’s a little closer to home. He’ll be discussing what we can learn from studying dwarf planet Pluto blocking out (or occulting) the light from distant background stars. In Sunday’s New York Times had an Op-Ed piece ( “Praise of not knowing” by Tim Kreidler) that praised the observations of Pluto’s surface from the Hubble Space Telescope but said that nothing more would be found out about Pluto until NASA’s New Horizons mission gets there in 2015. The latter statement is flat wrong, since three independent groups are studying Pluto and its atmosphere by watching it go in front of, “occult,” distant stars. As I write, I am in Pasadena, en route to Hawaii for a rare double event: On Wednesday/Thursday night, June 22/23, both Pluto and its moon Charon will occult a 13th magnitude star, each occultation lasting a minute or so and separated from each other by 12 minutes. On Sunday/Monday night, June 26/27, Pluto will occult a star, and over a much narrower path, its small moon Hydra might also occult a star. But to see those occultations, we have to be in a particular set of places on Earth, those over which the shadow of the object in starlight passes. Since the stars are so far away, their light is essentially parallel and the shadows of the objects on Earth are the same as the sizes of the objects. With such a long lever arm as the distance from Earth to Pluto, the positions of the solar-system objects and the stars have to be known to better then a tenth of an arcsec. When I joined this game at the invitation of Jim Elliot of MIT about 10 years ago, the predicted paths could change by 1000 km or more a few days before the event; in 2002, we had a mad scramble to move our equipment 1000 km north a couple of days before the predicted time and date. Now, the models used by our MIT, Lowell Observatory, and U.S. Naval Observatory colleagues to make the predictions are more accurate, though they are being refined up to the last days with new observations taken in Flagstaff. A few weeks ago, on May 22, a fainter star’s shadow was predicted to pass over northern regions of Earth, with the centerline off the Earth above the north pole. We were, barely through clouds, able to detect the event for about 100 s at our home site at Williams College in Williamstown, Massachusetts, using the 24″ (0.6 m) telescope that is usually used only for students in the survey courses. (The detection, through fairly thick clouds, required careful subtraction of background and ratioing with a nearby, brighter star, carefully and expertly carried out by my Williams College colleague Dr. Steven Souza, and then remeasured by my Williams College colleague Dr. Bryce Babcock.) The detection gives us more confidence than we had in the accuracy of the prediction. Jim Elliot, who died in March, was a friend of mine from graduate school in the 1960s. He came to fame in the 1970s when he, accompanied by junior colleagues Ted Dunham and Doug Mink, discovered the rings of Uranus by their sequential occultations of a distant star, observing from NASA’s Kuiper Airborne Observatory, an instrumented airplane. It turned out that my fast-readout equipment used to study total solar eclipses was similar to the equipment he used to study stellar occultations, and a partnership was born. My students and I first tried to help him discover rings around Neptune when we were in Indonesia for the eclipse of 1983, since a Neptune occultation observed a few days later. We were clouded out. In 1997, Babcock, student Tim McConnochie ’98, and I tried to observe the atmosphere of Triton as it occulted a star from Australia. We got data, but no occultation showed from our site; the prediction had moved even farther north than we had thought a few days in advance, when we made a mad dash 1000 km north from Siding Spring Observatory to a telescope of the University of North Queensland in Toowoomba—the farthest-north telescope in Australia at that time. In 2002, an occultation of a star by Pluto was predicted, and we brought our equipment to the University of Hawaii’s 88″ (2.2 m) telescope on Mauna Kea. MIT colleagues were observing from the nearby NASA IRTF 3-m telescope. Our data were so good that I was hooked on occultation studies, and I have been working with Jim and his MIT team ever since. My colleagues at Williams Steve Souza and Bryce Babcock and a series of undergraduates have worked with me in these studies. When reduced, the 2002 data showed that Pluto’s atmosphere had warmed a bit and had doubled in density since the previous occultation 14 years earlier, a surprise since Pluto had passed perihelion in 1989 and was (and is) moving farther from the Sun each day. Apparently, the kind of thermal lag that makes our terrestrial daytime temperatures peak closer to 4 pm than to noon was operating on Pluto as well. The key question was and is whether any atmosphere would remain around Pluto when a spacecraft got there, or would it snow out by then. Subsequently, NASA launched its New Horizons mission to Pluto, run by Alan Stern and colleagues at Southwest Research Institute in Boulder, Colorado, and administered at the Johns Hopkins University Applied Physics Laboratory. By showing that Pluto was still warming, our MIT-Williams team’s data indicated that the atmosphere would probably remain warm enough by 2015 for the spacecraft to detect it nicely. Since then, we have observed several other occultations, taking data at about 4 times per second (4 hertz = 4 Hz), which indicate that the temperature and density changes have leveled off, though they have not yet started decreasing. Based on our success, we put in a joint equipment-grant request to NASA, which, when granted, allowed us to buy six special cameras (3 for MIT and 3 for Williams College), which we linked with GPS for time signals and computers in systems each called POETS: Portable Occultation, Eclipse, and Transit System. We have used ours in solar eclipses in Greece in 2006, Russia in 2008, and China in 2009, as well as on Sacramento Peak for the Mercury transit of 2006, so POETS has lived up to its name. We have worked closely with these cameras since then, linking with Jim Elliot, Mike Person, and Amanda Gulbis at MIT (Gulbis is now at the South African Astronomical Observatory in Cape Town, though retains a visiting appointment at MIT). In 2005, from several telescopes in Chile, our MIT-Williams team captured an occultation of a star by Pluto’s moon Charon. Whereas the dimming of starlight by Pluto is gradual because of Pluto’s atmosphere, the dimming by Charon was abrupt, showing that Charon has no atmosphere. Both our 2002 Pluto occultation and the 2005 Charon occultation results were published first in Nature, a sign of their importance. Two competing groups, one headed by Leslie Young of Southwest Research Institute, a former student of Jim’s, and another headed by Bruno Sicardy of l’Observatoire de Paris at Meudon in collaboration with Thomas Widemann also of that French observatory, also make similar measurements, and we often vie with them for access to telescopes in given spots. In 2010, we were able to accomplish a long-term goal of Jim’s, to detect an occultation by a Kuiper belt object beyond Pluto. We keep astrometric track of a dozen or so of the largest KBOs, to look for potential occultations. When 2002 TX300 was to pass a star, we were ready. I had arranged for Wayne Rosing and colleagues of the Las Cumbres Global Telescope to use their Faulkes 2-m telescope on Haleakala, Hawaii. Bryce Babcock and our student Katie DuPré ’09 were observing with a POETS from a 16″ telescope at Leeward Community College on Oahu, and Steve Souza took one of our fancy POETS to the Big Island. Unfortunately for us, NASA was crashing its LCROSS mission into the Moon only about 55 minutes after our predicted KBO event, and we couldn’t get any of the major telescopes on Mauna Kea to do our task–which turned out to be more interesting and important than what they were doing. In the event, Souza aggravated an old shoulder injury and a local University of Hawaii at Hilo student who had been assigned to work with him used his own telescope and CCD from a parking lot at the Onizuka “mid-level facility” halfway up Mauna Kea. When the data were reduced, Faulkes had beautiful data with about 50 points of dip in total intensity because of the occultation, the Big Island data had only two low points (given their slower cadence) but that was enough to confirm the occultation and to set limits on the orientation of the image, and the Oahu data were of high quality but showed no dip. With those observations, again published in Nature, we concluded that the KBO, which has the asteroid number 55636, was only 143 ± 5 km in radius. Had we known it was so small, it wouldn’t have been on our list, since we would have had little hope of detecting it occulting anything! Anyway, to be so small and to have its observed brightness, it has to have 90% albedo, making it the brightest known thing in the solar system. That it is bright was not a surprise because it was thought to be in the family of the dwarf-planet Haumea, which is covered with ice. But for the ice to be that bright rather than darkened over the billions of years of time since its formation was a surprise. We have a variety of websites describing our work on occultations. Last year, I set up a site put together by our Williams College student Caroline Ng ’11. It has links not only to our own work but also to the websites of Mike Brown at Caltech and Mike Person and others of the MIT group. When I was on sabbatical at Caltech in 2008-9, I worked with Mike Brown and his group on some mutual events of Haumea and its moon Namaka, with the most interesting and pleasant of our attempts when I was hosted by Meg Schwamb at the 200″ (5 m) Hale telescope at Palomar for one of the predicted 1% events. Now we are en route to Hawaii tomorrow for this week’s occultations. Maps and details of the predictions can be found here, and more detailed information can be found on this site. Mike Person now heads the group at MIT. Carlos Zuluaga at MIT keeps the predictions up to date. Amanda Bosh is now a scientist in the group there. For the June 22/23 event on payday loans uk (June 23 UT but June 22 in Hawaii), the star is a magnitude 14.4 in the standard, UCAC2 catalogue. The revised, recent predictions seem to have shifted the prediction south, so that Hawaii is slightly off the main predicted path, to its north. The island sites are still within the uncertainty for both Pluto and Charon, so we can still hope to see the events. One MIT person, Amanda Zangari, has gone to Cairns, Australia, to see if it goes that far south. The event is particularly exciting because if we capture both Pluto and Charon nearly simultaneously, we can find out about the system’s internal orbits with higher precision than before, perhaps allowing a refinement of the center of mass and thus the masses and densities of each object. Another excitement is to be the first deployment for an occultation of the NASA/German SOFIA airplane, the successor to the Kuiper Airborne Observatory that has been so long in being readied. Mike Person is Jim Elliot’s successor as co-Investigator, and Ted Dunham is also a co-Investigator. They will fly to the centerline of the latest prediction, which, as of today (Sunday before the events) is off the coast of Mexico. For the June 26/27 event (June 27 UT but June 26 in Hawaii), the star is magnitude 13.6, a couple of magnitudes brighter than most of the stars we have observed being occulted, so the data would be particularly low-noise. In addition to the occultation of Pluto itself, whose southern limit is predicted to pass through the Hawaiian islands, the tiny Pluto moon Hydra is to be occulted, though that narrow path’s prediction now passes north of the Hawaiian islands. We have arranged for telescopes in Yunnan, China, in Japan, Taiwan, and Thailand to observe with us, and MIT’s Matt Lockhart is en route to Yunnan with one of our POETS cameras. We have Australian sites still observing as well, just in case the actual path is hundreds of kilometers south of the predictions. Bryce Babcock will observe at Leeward Community College with Mohanan Kakkala there, our alumnus Eric Pilger ’82, and my summer student Shubhanga Pandey ’13. I will observe at Windward Community College with Joe Ciotti and Marvin Kessler of the faculty there and their students, as well as with my summer exchange student, Keck Northeast Astronomy Consortium Wesleyan student David Amrhein ’12, with MIT undergraduate Stephanie Sallum ’12, and with Robert Lucas from the University of Sydney. Our work is supported by a research grant from NASA’s Planetary Astronomy Division. In about a week, if all goes well, we will know a lot more about the Pluto system. We’ve been having some trouble with the candidates page today (tentatively because we’re receiving repeated hits on it from a single external source), and so we’ve taken it down temporarily. We hope to have it back soon. Today’s blog post is brought to you by zookeeper extraordinaire Chris Lintott. Last week Meg visited me in Chicago for two days of number crunching and data discussion and analysis. We got a lot done (and crushed Zooniverse developer Michael Parrish at shuffleboard) and I’ll write more about that soon, but a lot of our talk centered on a very unusual system unearthed by a few persistent Planet Hunters. Once the team had – prompted by posts at Talk – taken a closer look at the system in question (we’re keeping the name under wraps for now) we were pretty excited, but also slightly worried. The system in question seems to have multiple transits, but they imply that there would be two large planets relatively close to each other. So close, in fact, that a back of the envelope calculation suggests that they would be expected to disrupt each other’s orbits. So unless our rough working is wrong (certainly possible) or we’ve caught the system in an unusual time during its evolution (surely unlikely) then there’s something mysterious here. That, of course, is the perfect excuse for an observing run. We’re lucky enough to have access to the Keck telescopes on Mauna Kea in Hawai’i (probably my favourite place in the whole world). Observing at Keck is a little different from the telescopes that I’m used to – rather than trekking to the summit where a lack of oxygen can make observing difficult, Keck astronomers observe remotely, either from sea level in Hawai’i or from their home institutions. The initial goal of our observations wasn’t to confirm the existence of the planets – the star in question is too faint to make that easy – but to rule out obvious problems. In particular, the team were worried that we weren’t looking at a single star, but receiving light from a combination of a nearby star and a background eclipsing binary which would then be responsible for some or all of the transits. If that’s the case then we should be able to see relatively large wobbles revealed by the stellar spectrum as the binary stars move back and forth. These will be larger than the faint wobble induced by the planets (if they exist) and checking whether they exist or not will take no more than a couple of observations, each lasting less than an hour. I’ll report back on the Keck observations. Fingers crossed! Hey everyone! For the last month and a half I have been playing around with a program called LCME (Light Curves Made Easy) written by our own Matt Giguere modeling the Planet Hunters planet candidates. The program creates a graphical user interface that can be used to evaluate the same light curves you see when looking for transits. All I have to do is enter the ID# of a promising star, and it displays the curve in a graph. I click around for a few minutes, marking where I think the transits are on the graph, and the program is able to estimate the location and duration of all potential transits. It then uses this information to get what we really want: an estimate for the radius and period of the planet candidate. On the technical side of things, once I point out the parts of the graph with dips in the light curve, I can ask the program to trace a curve mirroring the data using a box-least-squares fit. The box version of the least-squares method, not unlike finding a standard deviation, attempts to minimize the error between the components of each point’s position vector and a linear (or nonlinear) trendline that fits the data. Most significantly, it can “predict” the further locations of dips in the light curve that I don’t personally highlight. If the data is confusing or the least squares fit gives a worse estimate than my own (as was the case last week when I was examining a multiple planet system) I can phase-fold the data to get a more accurate reading. This stacks the mini-image of each period of transit on top of each other and finds the mean values to create a totally new array that is (hopefully!) more accurate. I can also use the Levenberg-Marquadt algorithm to minimize the sum of the squares of the deviations of all points from the least-squares-fitted curve, or make a lomb-scargle periodogram to, if the light is broken down into frequencies, find the time at which sample frequencies are mutually orthogonal.